Well, I survived my first puppet show. 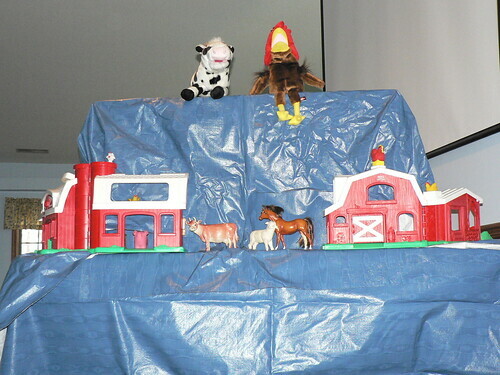 A group of about 25 kids gathered for the morning Bible story, when Calvin (a cow) and Brewster (a rooster) made their first appearance to tell the kids the biblical story about Jesus’ birth. Then in the afternoon a class of about 15 assembled for the same story. Puppeteering is so much harder than I thought! In the first time around, my voice about went out, my arms were so tired I could barely hold them up, my hands got so worn out I could barely move the puppets’ mouth, and it made my legs so wobbly that I’m still having some trouble walking right. Wow–who knew?!? Oh yeah, and I realized halfway through the story that I was inhaling each time a different puppet talked, so I never actually exhaled, and I felt like my lungs were going to burst. Weird stuff. The second time around I made some adjustments and it seemed to help. Only problem was I accidentally knocked into the script, which was spread on the table in front of me but behind the curtain, with my body–and with puppets on both hands, there was nothing I could do about it. So a little improvising was necessary to cover for the words I couldn’t see! Oh yeah, I forgot to tell you the embarrassing part. The second Bible story time ended as parents from another class were arriving to pick up their kids… except that one of them arrived early. She heard something going on in the sanctuary, and when she peeked in, there’s the pastor on his knees with a cow that sounds like James Earl Jones on his right hand, and a rooster that sounds like a surfer dude on his left hand. When I walked out of the sanctuary, she was sure to let me know she’d seen my puppeting in action! How embarrassing.